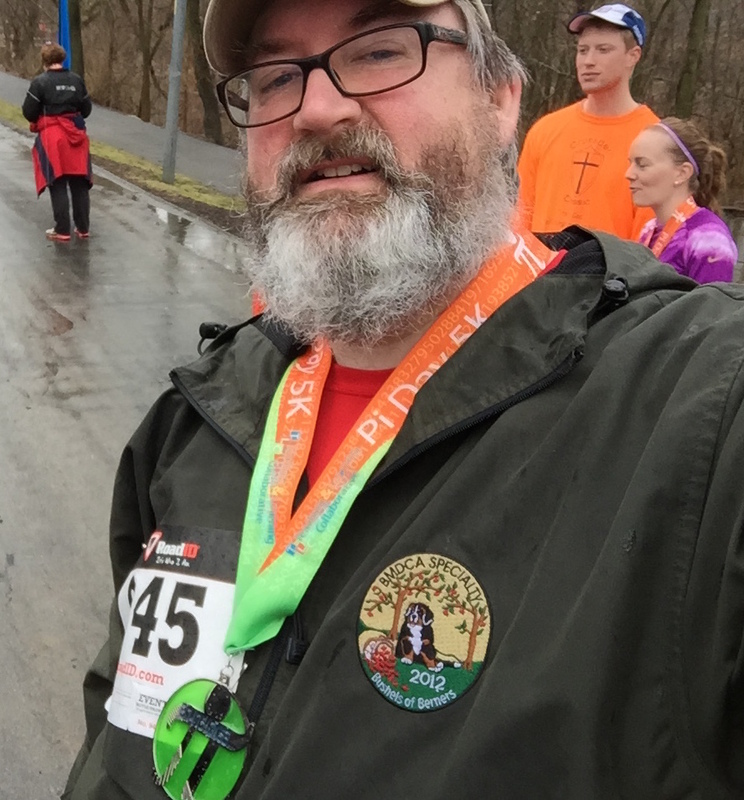 For my twenty-fifth race, I picked a doozy — a once in a century event. You see, Pi Day is celebrated every year on March 14th (3-14) — the first three significant digits of pi. This year, the once-a-century alignment of month, day and year creates an über pi day (3-14-15). So now, start a race at 9:26:53am that morning, and you’ve got a major pi event (3-14-15-9-26-53 … the first ten significant digits of pi). I drove to Columbus OH for this race, with most of the drive in a rainstorm. Nothing like almost eight hours of pouring rain to get ya off to a good start, eh? Add to that a temperamental GPS — I mean, who sends you through the downtown maze of interstate connections in Columbus at rush hour? — awful traffic, and a tired guy, and you have the ingredients for a grumpy driver. I got there safely, though, and that’s the important part. Saturday morning, it was still raining, but the temps were in the high 40s, and there was no wind. If it’s gonna rain on a run, those are pretty good overall conditions. And frankly, I enjoy running in the rain. It’s settling, peaceful, and is usually a wonderful experience. A few days before the race, the race organizer let me know that the packets for the out-of-town participants would be at the race site at the Very Important Pi People (VIP2) table. it’s the first time I’ve been a VIP at a race, so I enjoyed that. They really seemed to be unaccustomed to folks coming from out of state for this fundraising race for the local school district. But with a cool event offering a really nice medal, I’m surprised they didn’t have more out-of-staters in attendance. The race was awesome. The foot pain that kept me out of the races in Lincoln at the beginning of the year flared back up, so I took it easy, and mostly walked the course, which wound through a suburban park. I had no idea what to expect from the course, but it was a paved trail, and very easy to navigate. And it was flat! A little over four kilometers in, I started to see people go off-trail, and up into the woods. I quickly saw why. The trail was flooded for about fifteen feet, and they didn’t want to go through the shoe-high water. 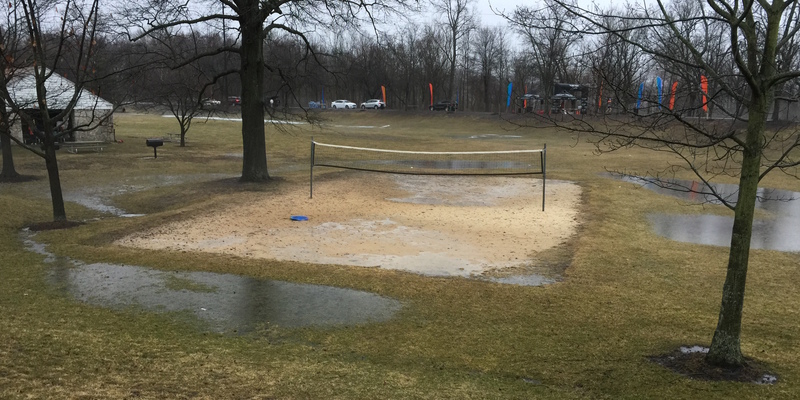 After earning my water wings in the Sandmine Challenge a couple of weeks ago, I simply couldn’t go around, and high stepped through the mini-lake! And of course, that meant I passed about fifteen folks that were up in the woods. Woot! I came around the corner, ran to the finish (because you always run to the finish!) and collected my medal. They had engravers on the spot, so I turned my medal over to them, and had my name and time engraved… except it wasn’t. I’ve spent some time over the last few months looking for medal-bearing 5k races to fill out my running calendar for this year. I’d already registered for a few races here and there, generally some of the ones I ran last year. However, I wanted to find some other races this year, maybe even in different places. So over the weekend, I signed up for two fun-sounding races. 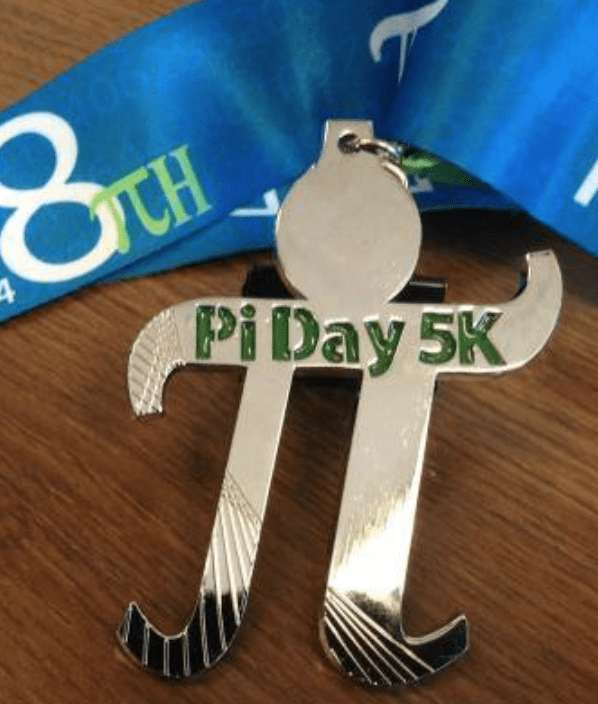 The first is the Pi Day 5K in Columbus OH. This one takes place on March 14th, and the race begins at 9:26:53 AM … 3.141592653. Get it? Add to that a pretty cool medal, and I’m in! I’ve never been to Columbus, so it’ll be interesting to see what’s there. The other race is in December, and I simply had to sign up for this one. For the third year, Cleveland OH is hosting the Christmas Story Run 5K. The cool thing about this one is the leg lamp themed medal. And, of course, the Rock and Roll Hall of Fame is there, so I’ll definitely be spending some extra time wandering around there. The last race I’m watching for is on/around October 21. You see, Marty McFly visited the future on October 21, 2015, and I’ve gotta figure someone will have a race to commemorate that!